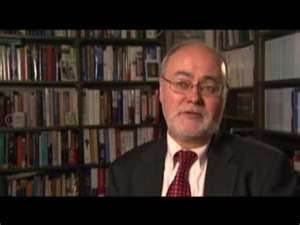 As I have indicated in my many posts on this issue, this has continued to be one of the most contentious debates in the social sciences, with some social scientists (such as Richard Wrangham) arguing for the Hobbesian position that the evolution of our foraging human ancestors was shaped by warfare, and others (such as Douglas Fry) arguing for the Rousseauan position that nomadic foragers were generally peaceful, and that war was a cultural invention of the agricultural societies that emerged 5,000 to 10,000 years ago. And yet while the evidence pertinent to this debate has been growing, the evidence is still limited in ways that make it difficult to reach any demonstrative proof. Inferences about warfare among prehistoric foragers from ethnographic reports about foraging societies are open to dispute, because modern hunter-gatherers might be quite different from prehistoric hunter-gatherers, and because we can argue about whether acts of violence against individuals or small groups of individuals should be described as warfare. 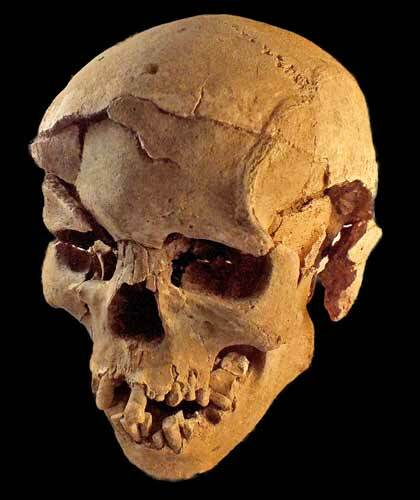 The archaeological evidence for prehistoric warfare among foragers has been severely limited, because when prehistoric skeletons show signs of homicidal violence, it's hard to know whether this should be interpreted as showing warfare rather than inter-personal violence within a society. 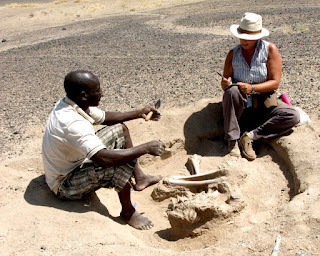 But now in this week's issue of Nature, we have a report of the first prehistoric skeletal evidence for a massacre in a foraging society: Marta Mirazon Lahr, et al., "Inter-Group Violence among Early Holocene Hunter-Gatherers of West Turkana, Kenya," Nature 529 (21 January 2016): 394-398. The New York Times has an article about this. A team of scientists reports the discovery of the first clear evidence of the intentional killing of a small band of foragers in prehistory. In 2012, they found the skeletal remains of 27 individuals at the site of Nataruk, west of Lake Turkana in Kenya. The skeletal remains are dated at around 10,000 years ago. 12 of the individuals were preserved as articulated skeletons. 10 of these 12 show evidence of major traumatic lesions that would have been lethal. There are fractures from violence in heads, necks, hands, and ribs. For example, the skull pictured above shows multiple traumatic lesions to the cranium, involving blunt force to the frontal and left temporal bones. In one case, a projectile was found embedded in a cranium. In another case, projectiles were found within a body cavity. There is no evidence of burial for any of these skeletal remains. The Hobbesians like Richard Wrangham will see this as one of the best archaeological discoveries for confirming that warfare was part of human evolution in prehistoric foraging societies before the invention of agriculture. But the Rousseauans like Douglas Fry will say that skeletal evidence like this from one site is not enough to be conclusive. As quoted in the New York Times article, Fry has also said that these foragers might have been moving away from a purely nomadic life to a more settled life, and thus this would not be evidence for warfare among nomadic foragers. "As one of the clearest cases of inter-group violence among prehistoric hunter-gatherers, the event recorded at Nataruk offers information on the socio-economic conditions that marked the presence of warfare. However, there are two interpretations of how this fact impinges on our understanding of war among foraging societies. West Turkana 10,000 years ago was a fertile lakeshore landscape sustaining a substantial population of hunter-gatherers; the presence of pottery may be indicative of some storage and so reduced mobility. Thus, the massacre at Nataruk could be seen as resulting from a raid for resources--territory, women, children, food stored in pots--whose value was similar to those of later food-producing societies among whom violent attacks on settlements and organized defence strategies became part of life. In this light, the importance of what happened at Nataruk would be in terms of extending the chronology and degree of the same underlying socio-economic conditions that characterize early warfare in more recent periods. Alternatively, Nataruk may offer evidence not of changing conditions towards a settled, materially richer, and demographically denser way of life, but of a standard antagonistic response to an encounter between two social groups. As such, Nataruk would be important for the particular circumstances that preserved an ephemeral, but perhaps not unusual, event in the life of prehistoric foraging societies. In either case, the deaths at Nataruk are testimony to the antiquity of inter-group violence and war" (397). The first of these two conflicting interpretations supports a modified version of the Rousseauan view. The second interpretation supports the Hobbesian view. The news reports about this article (here, here, and here) suggest to me that Marta Mirazon Lahr, the lead author of the article, is taking the Hobbesian view, while Robert Foley, a co-author, is taking a modified Rousseauan view. In the Discourse on the Origin of Inequality, Rousseau claimed that warfare began with the invention of agriculture, which he called the "great revolution," because it brought the territorial settlements, the accumulation of property and the status hierarchies that provided the conditions for war. But Rousseau also recognized that before agricultural societies, the "first revolution" in human history was the establishment of family life in settled societies that produced some forms of property. Some anthropologists today might see this as the pre-agricultural revolution in which nomadic foragers moved towards becoming complex foragers living a somewhat settled existence. If there were some abundant source of food, such as fish along a shoreline or in a river, foragers could camp there, either seasonally or year-round. They could then store some of their food. And their population could grow. But once they took control of this territory and its abundant resources, they became targets for other foraging bands who might want to take their property, and thus began warfare. There are many examples of this in the ethnographic and archaeological record. The most famous example of this is the complex foraging societies that formed on the Northwest Coast of North America. Once formerly nomadic foragers became dependent on the intense harvesting of aquatic resources, they settled into permanent villages, in which there was increasing population and inequality in property and status, and which produced competition over valuable resources (stored food, territory, and women) that led to warfare. These complex foraging settlements have appeared thousands of years before agricultural settlements. By contrast, fully nomadic foragers show inter-personal violence within their bands, but not inter-group warfare. 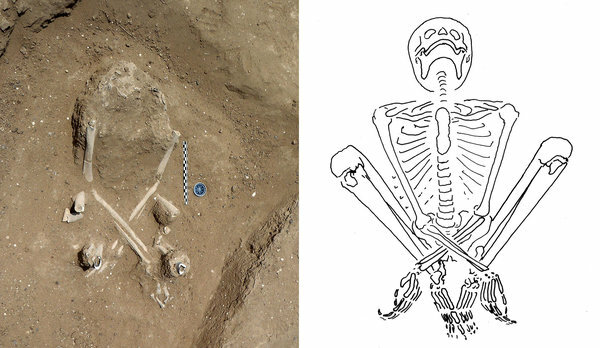 "According to Foley, the skeletons appear to have belonged to a group of hunter-gatherers living at the time on the lush, marshy edge of a lagoon where they used bone harpoons to fish and hunt. They were probably more sedentary than most foraging communities, as there are indications that the environment was quite rich. "Although any guesses as to why they were killed are speculations, Foley said it is possible that another group found the area attractive and competed for it." "The number of casualties rules out the notion of an interfamily feud, Foley said. More people from the group may have been killed, and still others may have escaped, which suggests the group was larger than the average hunter-gatherer group. (Most hunter-gatherer groups tend to hover around 25 to 30 people per encampment, Foley said.) And given the simple tools used to deal death, the attacking group was probably larger still, he added. "This idea suggests that the two warring groups were likely more settled than the average hunter-gatherer population, Foley said. That's not surprising, as hunter-gatherers who tend to stay in one place for longer periods often live near lakes, where food is plentiful and unlikely to be depleted by long stays, he added. "'That fits into the idea of a slightly more densely packed population where intergroup conflict is likely to arise,' Foley said. 'It's quite difficult to have a war with a highly mobile group that's very dispersed.'" Douglas Fry agrees with Foley in seeing this prehistoric warfare in Nataruk as showing the intergroup violence that arises among complex foragers, but not among fully nomadic foragers. Thus, Fry can argue that this discovery support his Rousseauan view that throughout most of human evolutionary history, when human beings lived as nomadic foragers, there was no warfare; and consequently war must be seen as a cultural invention of recent history. Lahr, however, seems to disagree with Foley and Fry. As quoted by Deborah Netburn of the Los Angeles Times, Lahr says that while there is lots of evidence of warfare "among settled, sedentary communities," the discovery in Nataruk is the first "archaeological record of armed conflict between early nomadic hunter-gather groups." She suggests that the foragers who were massacred had not established a settlement on the lake, but rather they were a "small traveling band of hunter-gatherers who stopped by a lagoon to hunt or fish." And so, she seems to be adopting the Hobbesian interpretation of this archaeological discovery as confirming that warfare was prevalent among our earliest foraging ancestors, and thus deeply rooted in our evolved human nature. Some of my posts on this debate over the evolution of war can be found here, here, here, here, and here, which include links to many other posts on this.